The Global Procurement Study Series thoroughly investigates procurement topics and derives scientific models from the achieved results. The first study was conducted in 2009 and succeeded by a follow-up study in 2011 and an additional one in 2013. The study series is overall unique in its size and scope, concerning the number of participants, their countries of origin, industries covered and diverse participation by company size. The overall number of participants adds up to 2,400 from 94 different countries. In total 240 questions were asked and used for empirical analysis. The III. Global Procurement & Supply Chain Management Study was conducted in 2013 and is a follow-up study constituted on the results of the precursor studies executed in 2009 and 2011. The Study is overall unique due to its large size and broad scope, in terms of the number of participants, their countries of origin, industries covered and diverse participation by company size. It focusses on today`s top management relevant procurement topics, which were analyzed by a team with an outstanding expertise in procurement (Kellogg School of Management, 4 HBM publications). The results are available for purchase at the Harvard Business Manager. In the II. 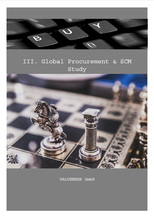 Volume of the Global Procurement Study more than 1,000 participants from 67 countries, all industries and company sizes in terms of revenue did participate and make this study unique. The study analyzes current trends, the impact of the Fukushima catastrophe on procurement and introduces a new procurement specific framework, which was developed by a team with an outstanding expertise in procurement (ESSEC, 4 HBM publications). Additionally it covers the first relevant analysis of how the personality and leadership skills of a Chief Procurement Officer (CPO) influence a company’s procurement performance.